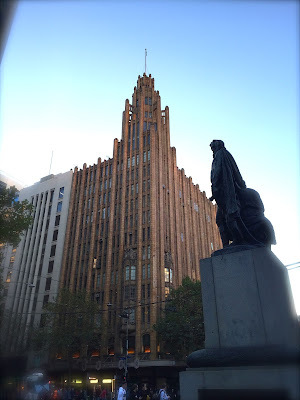 With its imposing modern Gothic-style turreted tower and a façade coated in moulded terra cotta faience of gold-brown lavishness, this gargantuan building prominently situated at the corner of Swanston and Collins Street possesses all the necessary elements to be a legend. Its fancy pinnacles made it the tallest building in Melbourne in the 1930s. It had the first escalator in the state of Victoria. It was the most quickly constructed building in Australia, a title and accolade that it proudly held on to until 1980s. Each of the twelve floors was completed with astonishing speed within 7 to 10 days. Construction works continued day and night on round-the-clock eight-hour shifts during the Depression period, where labour was cheap and workers were desperate. What’s more, the building has its fair share of dark, mysterious history: an unsolved murder case in 1978 involving three jewelers being shot in head execution-style on Level 8 of the building. The building was first bought and served as a new headquarters for the Manchester Unity Independent Order of Odd Fellows (IOOF), a friendly society motivated by benevolence and practical moral code, and embellished with secret passwords, hand signs, symbols, rites and ceremonies. The organization was set up at the time when a welfare state was non- existence; the protection and care for the members and their families became an essential aim which the IOOF has steadfastly upheld for decades. In 1993, the Manchester Unity merged with the Australian Natives’ Association, and formed the national healthcare giant Australian Unity. Dr Kia Pajouhesh, the founder and managing director of Smile Solutions dentistry clinic is now the major custodian of the building, occupying levels 1, 10, 11 and 12 and the tower. When the various floors were first acquired by the dentist, the building was in a state of dilapidation. Extensive restorative works were carried out to reinvigorate the previous glory of this legendary masterpiece. Today, the Manchester Unity Building remains one of those iconic buildings impossible to be missed in the Melbourne city central. The gorgeous exterior impresses both visitors and local Melbournians alike. People are eager to take a peep at the long-heard beauty of the interior: the glamorous boardroom with its custom-built table topped by a single piece of glass, the rooftop terrace and its exotic garden and aviary, the intricately crafted ceilings and the extravagant use of marbles. In fact, the fascination is so strong that many are willing to pay the rather upscale price for a meal and exclusive guided tour combo to personally experience the grandeur and inhale the splendor of its exquisite interior.